Our Mens Luxury Terry Shawl Collar Robe in 100% ring-spun cotton (16 oz.) comes in 5 sizes for a perfect fit! Premium quality made exclusively for Wittmann Textiles in Turkey. Available in White or Blue. Please use size chart tab for best fit. Machine wash / dry with cold water - do not use bleach or hot water. 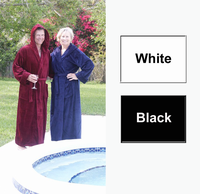 Luxurious Terry Cloth Bathrobes feature thick 16 oz 100% Cotton terry cloth (like a big extra thick towel). 5 sizes from Small through 2XL and two lengths 48 and 53 inch from the back of the neck to the bottom hem. The robes have terry loops on both sides of the fabric for maximum absorbency! The average weight for each robe is 4-5 pounds. Complete with 3 stylish and practical pockets, two hand pockets and a breast pocket. Size Chart reflects the new shipment of robes that are more generous in sizing. Please use this chart instead of the one in our new 2015-2016 catalog. *Length - From the back of the neck to the bottom of the premium robe. The average weight for this robe is 4-5.5 lbs. (varies from Size Small to Size 2XL and 48 or 53 inch length).